There are many different styles and textures of rugs that I have purchased and enjoyed. However, I don't use rugs on my floors. Instead, I hang the rugs on my walls. I'm not a fan of painting, and when I purchased my brand home, I was trying to look for a way to liven up my rooms while painting as few rooms as possible. I saw lots of nice artwork that I thought might work, but as my home had very high ceilings in many of the rooms, most of what I looked at didn't seem big enough to fill a wall. That's when I had the perfect idea. I'd hang rugs on my walls! 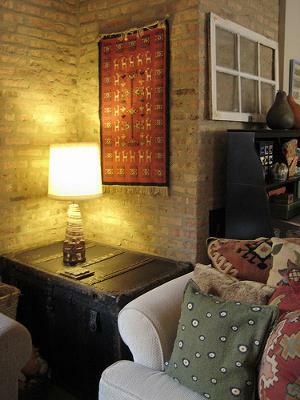 At first I was concerned that finding a way to hang the rugs without damaging either the rug or the wall would be a problem, but it turned out to be very easy. You can just nail or staple a piece of wood of the rug's size to your wall, and then attach the rug to that piece of wood using Velcro. This worked great for me, and it also makes it very easy to change decor in the future. I have several rugs hanging on the walls of my home now. I think they really set off the rooms that they're in. I get compliments about them from everyone who visits my home. I'd recommend using rugs on walls to anyone. This sounds like a good idea Stephanie - particularly if you have a wall with a bad finish, mark or blemish that you want to hide. Kilims - the flat rugs woven in many areas of the globe are often exquisite with colors and add depth as well as a unique feel to rooms and to my favorite areas which are stairway high walls. Antique or new, they are fairly cheap and can be found at Heritage Unlimited and on ebay - wish I could attach a photo. Hi Linda and thanks for getting in touch. If you would like to send in a photo (please do! ), click here, scroll down to the place where it says 'click here to see the rest of the form and complete your submission' - there is a photo uploader there. Many thanks. I love this idea and there is such a selection of different patterned rugs available. Is Velcro strong enough to hold the rug in place? According to the Velcro website, Heavy Duty Stick On is recommended for rugs and can support a weight of up to 7kg per 50mm x 50mm square piece.